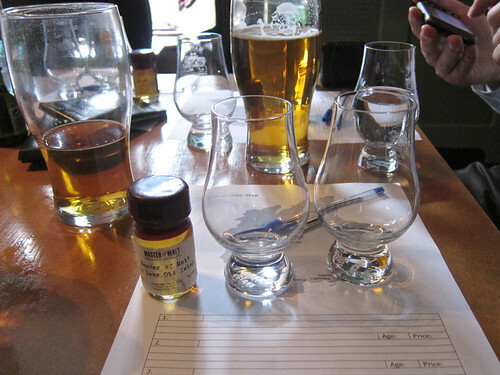 Impressively it seems that a year has passed since the first Whisky Squad meetup. I wasn’t present back in that dim and distant time (having only met co-founder Andy a few days earlier and already been booked up for three months of first Thursdays) but I have heard tales of whisky excellent and vile, and exploits terrifying and daring. The story-telling was mainly fuelled by beer but I trust the tellers implicitly, although I’m not sure how a T-Rex would get through The Gunmakers‘s front door or how a single pork scratching could drop one before it ate any customers. Anyways, the whiskies were all tasted blind, as usual, and the first one started of with a nose of bubblegum, apples and pear drops with a big savoury base. To taste it had citrus, cinnamon spice, sweet fruit, orange pips, sour wood and a hint of rubbery bitterness. Water brought out some fizzy Refresher flavours but left the big bitter finish. 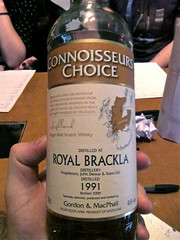 The paper came off to reveal that it was a Connoiseurs Choice Royal Brackla 1991, bottled at 17 years old. The distillery isn’t particularly well known, despite being the first to receive a royal warrant (hence the Royal in its name), and sits on the edge of Speyside, variously being described as a Highland or Speyside whisky depending on who you ask. The distillery was founded in 1812, its imminent 100th anniversary being the reason for being included in the line-up, by Captain William Fraser and was simply known as Brackla until receiving its warrant from William IV in 1835. It continued on, with the normal changings of hands and rebuildings, until 1985 when it was closed. It reopened in 1991 under the banner of United Distillers and Vintners (now Diageo) and was sold to Dewars in 1998, the current owners, who use the distillery to mainly produce whisky for their blends as well as Johnnie Walker and others. Its connection with blended whisky goes back a bit further, with Andrew Usher (the ‘father’ of whisky blending) being employed by the distillery in the 1860s and using its spirit in some of his initial blends. There aren’t many distillery bottlings (other than an old Flora and Fauna from the UDV days and a 10yr old from 2004 that I’ve seen mentioned) but thanks to its life as a whisky sold for blending it appears fairly often from independent bottlers, such as Gordon & MacPhail who bottle the Connoiseurs choice range. Number two started the regular round of more evocative description with a ‘Smells like Timpsons’, and had a nose of pain stripper, PVA glue, a hint of leather, bananas, sweet fruit and gomme syrup. To taste it was backed with marzipan, with raisins, tart white grapes, butter and woody spice. Water brought out some citrus and transformed it into a Fry’s Orange Cream on the nose. Honey and spice appeared in the taste, along with oranges and lemons, and the finish brought in some burnt wood. 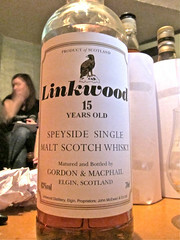 The bottle was uncovered to reveal that it was a Gordon and MacPhail Linkwood 15 year old. The distillery is in Elgin, in the heart of Speyside and is owned by Diageo. It opened in 1824 and has been distilling continuously since, apart from closures during the second world war and from 1985-1990, two times when many distilleries went dark. When it reopened after the second world war not much changed, with distillery manager Roderick Mackenzie taking the ‘nothing must change, just in case it changes the characteristics of our spirit’ to a level beyond most managers, anecdotally insisting that spider webs must be left alone for fear of making changes to the flavours. Linkwood is another distillery that doesn’t get much love in the way of distillery bottlings, with the sole official release being a rather lacklustre Flora and Fauna entry, but it’s much loved by the independents and appears quite often – I’ve tried some especially good SMWS ones as well as a rather tasty one bottled for The Whisky Exchange’s 10th anniversary last year. 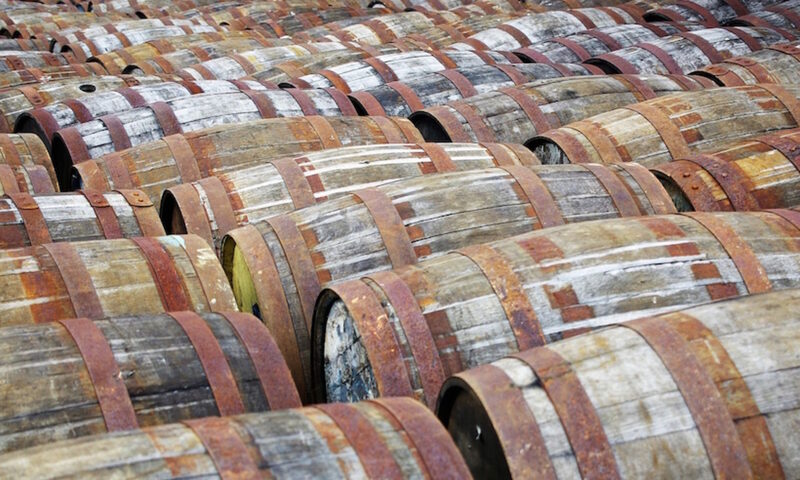 Outside of those bottlings it can be found as a component in many blends, especially those managed by Diageo. Number three came out of the gate with a call of ‘Buttered rum and biscuits’, with brioche, candied pineapple, wood, light tobacco and glue appearing on the nose. The gradual crystallisation of the more esoteric tasting notes led to ‘Like Colonel Gadaffi hiding in an old cupboard in Cuba’. To taste it started with soured fruit and moved through spicy cream to a lightly sour, rubbery finish. Water brought out more cream and softened the rubber, adding syrup sweetness and some dusty wood. Paper torn off, this turned out to be a Gordon and MacPhail Strathisla 25 year old. Another independent bottling, as Strathisla’s owners (Chivas Brothers/Pernod Ricard) only produce a single officially bottling (a quite tasty 12 year old that I tasted last year), this 25 year old is scarily cheap for its age, coming in at about £60, showing another bonus of independent bottlings – they often come in at much more affordable than an equivalent distillery bottling (if one was available). Founded in 1786 as Milltown and changing its name in the 1870s, Strathisla hasn’t closed since opening (making it the oldest continually operating distillery in Scotland, according to the internets and PR bumph) and these days is used as the heart of the various Chivas blends. The final dram for the night was rather distinctive in both colour and shape of bottle and even without that hint most people in the room would have guessed the distillery anyway. 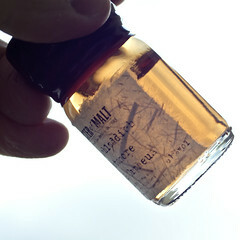 On the nose it started off with baby sick (dissected by those present into astringent sour milkiness) which faded with exposure to air to give mud, a hint of peat, and generally sour and salt scents. To taste there was a lightly sweet peatiness, sweet fruit, liquorice, peppermint and a touch of charcoal. Water brought out more minerality and a mulchy vegetable air. While the distillery wasn’t in question the exact expression was, with these guys being famed for the silly number of bottlings they’ve produced since they reopened 10 years ago (hence their inclusion in the list) – it was the Bruichladdich 2001 Resurrection Dram. This spirit was from the first batches that they produced when the distillery came back online in 2001, with this release was bottled in 2008 and limited to 24000 bottles, several of which have been sitting in Jason’s flat until needed. With Bruichladdich reaching their 10 year landmark they seem to be looking to cut down on their bottlings (a new one every couple of months as far as I can tell) and focus on producing a lightly peated core range (based around the 10 year old) and using their other brands (Octomore and Port Charlotte) to focus on the big peat that most people look for in Islay whiskies. It’s nice to see them calm down slightly, although whether they can stop master distiller Jim McEwan having crazy ideas is another matter. I was beaten to getting this written up yet again, this time by Charly over at Caffeine Frenzy Wanderlust. A couple of weekends back I found myself on the 6am train out of London Euston bound for Glasgow and this year’s Whisky Live Live Glasgow. It was rather a last minute thing, as I’d answered a request for help on Whyte & Mackay master blender Richard Paterson’s blog the week beforehand offering my services as a tweeter or liveblogger during the event. Whyte & Mackay’s social media supremo, Craig McGill, invited me along, blagged me a freebie ticket and jammed a Flip camera into my hand for part of the day – it was rather good fun. While I was there under the auspices of a free W&M ticket the brief was very much wider – wander round, talk to as many people as possible and just get a sense of the whole day for everyone. However, as a large part of the day focused around the W&M whisky media front man, Mr Paterson of the post title, I did spend more time with my sponsors than I planned. The day started off in slightly random fashion with me being pushed towards a stage by Craig and Richard to take part in a whisky blending session, but more of that in my next post. The day continued with stops at pretty much all of the stands in the small ballroom of the Glasgow Thistle and a break after lunch for the main Whyte & Mackay event – Richard Paterson’s 40th anniversary at the company. Richard Paterson is rather well known in the whisky industry. I’m not certain how much time he can devote to the duties his job title suggests, as for a master blender he seems to spend most of his time away from his blending room. He acts as the ambassador for almost everything in the Whyte & Mackay stable, including their range of blends as well as Dalmore, Jura and Fettercairn single malts. They are now part of United Breweries which, Richard announced, would soon overtake Diageo as the largest drinks company in the world. Richard has whisky in his family, with him being the third generation working as a master blender, and the week after Whisky Live Glasgow marked his 40th anniversary of working with Whyte & Mackay. 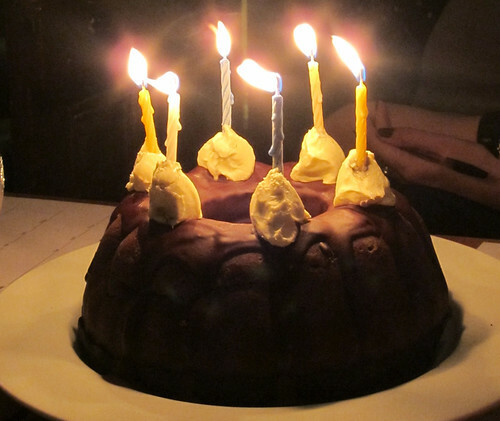 In celebratory fashion there was a cake and to accompany it there was a, less traditional, ‘tache mob, with free drams of Whyte & Mackay’s 30 year old blend and Fettercairn 40 single malt offered to anyone who turned up dressed as Richard, or at least moustachioed as he is. 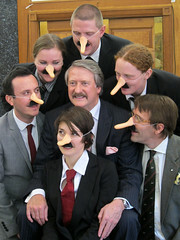 There was also a box of rubber noses, to honour his trademark nose, immortalised in the title of his book (Goodness Nose) and his twitter account (@the_nose). Suffice to say this was the most surreal part of the day. The new spirit came from the Glenglassaugh stand, where they were showing off their newly released range of ‘spirit drinks’. Mothballed in 1986, the distillery restarted production in 2008 and has been keeping themselves afloat until their new whisky comes of age by selling off both old stock and new make spirit. They started off with ‘The Spirit That Dare Not Speak Its Name’, new make whisky (the ‘whisky’ before it goes in a barrel) diluted to 50% (from the normal mid 60s% ABV), and progressed to ‘The Spirit That Blushes To Speak Its Name’, young spirit that had been matured for 6 months in red wine casks. These were quite popular, leading to them creating a range of drinks that were release recently. I grabbed a bottle of the Blushes, the new name for the wine cask matured spirit, while visiting Edinburgh recently but hadn’t had a chance to try it yet, so decided to have taste of some of the rest of the range at their stand. 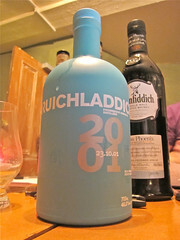 I first tried their Fledgling XB, spirit matured for 1 year in american oak casks. It had taken on a light yellow colour, and combined the caraway seed hints of new make spirit with vanilla essence on the nose. To taste it had a little edge of wood but was mainly a worryingly drinkable new make spirit. I moved on to the Clearac, the new name for the ‘Spirit That Not Dare Speak Its Name’. On the nose it had a touch of citrus as well as the usual new make aquavit punch and slight oiliness. It tasted similar to how it smelled, but yet again was worryingly drinkable. I stopped at this point and grabbed a bottle of Clearac and Peated, the version of their spirit made with peated barley, to go with the Blushes I had at home, to be doled out when I have people round to taste whisky in the future. I’ve been looking for commercially available new make spirit for a while, of which there are a few brands although generally either not very good or very hard to get hold of, and while these aren’t at still strength they are both educational, if you want to see how whisky matures in wood, and quite tasty. The next whisky I have notes on was a surprise on the Bruichladdich stand. I was walking past and heard someone mention Octomore 3.0 and doubled back quickly to make sure I hadn’t misheard. Bottled the week before this was one of the first outings for the distillery’s super-peaty whisky, with this one allegedly coming in at 155ppm of phenol, rather more than the 50-60ppm that you find in the regular ‘really peaty’ whiskies on Islay. After trying the Octomore 2.2 Orpheus the other week I was interested to see if this one lived up to my opinion of that previous release – in short, not really. 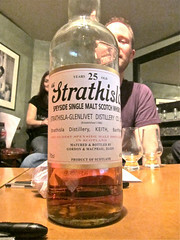 On the nose it had strong peat with mulchy undertones, an underlying meatiness, some wood and a hint of ammonia. To taste it had the expected burst of sweet peat and smoke but it was backed up by a sweet synthetic rhubarb taste, almost like rhubarb half of a rhubarb and custard sweet. 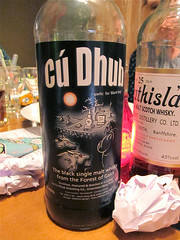 It was interesting and definitely one to try if you’re a peat lover, but it didn’t beat the Orpheus in my book. The one I got to taste was Fettercairn 40 year old. Fettercairn sits on the edge of the Grampian mountains and isn’t particularly well known for its distillery bottlings, as most of its production going into Whyte & Mackay’s blends, but the brand seems to be being resurrected recently as an avenue to continue their release of some old and rare single malts. Only 463 bottles of the 40 year old have been released (and as the drams we got where poured from a variety of randomly branded bottles pulled out of bags behind the stand I assume this is some of the whisky that didn’t get officially bottled) and it costs over £700 – it is the most expensive whisky I have ever tried. This was handed out to everyone who was dressed as Richard Paterson, or at least either had a moustache (real or fake) or expressed an interest in facial hair while standing near the Whyte & Mackay stand. On the nose it had heavy vanilla and almonds, with light honey, heather, salt and candle wax. To taste it had a sweetness down the sides of the tongue with a sour fruit centre, with a slab of orange peel, that turned quickly into spicy wood. A drop of water brought a some sawdust, fragrant wood and a hint of dryness. An interesting dram with a fantastic nose that I didn’t particularly like the taste of. Not to the tune of £700, anyway. I wandered out of the show with my two social media companions, Scott of In With Bacchus and Blair from the Aberdeen University Whisky Society, and settled down for a swift half and some reflection before we went our separate ways (me to my hotel, Blair to find more pubs and Scott to run back to Edinburgh and move into his university rooms to start a brewing and distilling course). The show itself was quite small and distinctly missing the big companies other than United Breweries (no Diageo, no Edrington group, no LVMH). Glenfiddich was there, along with the cooper and the second biggest stand in the room after W&M, but other than that it was the smaller names in whisky, along with some independent bottlers and a couple of food producers (with some excellent cheese, meat, fish and chocolate to nibble on). 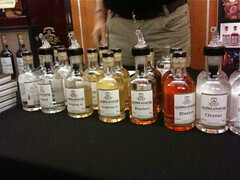 I got to try some interesting things, although as usual was rubbish at making notes, and the people on almost all of the stands were happy to talk about their whiskies and also knew what they were talking about, something you sometimes don’t get in larger shows, with distillery employees and whisky experts sent over rather than brand managers and professional stand staff. This is quite different to Whisky Live Taipei, which Blair helped out at this summer – a huge conference centre, all the big names, tens of thousands of visitors and a convention the likes of which you only find in the far east these days. The Glasgow show wasn’t something I’d normally travel a large proportion of the length of the UK to visit, but my trip does now mean that I have used the three oldest underground railway systems in the world and two of the three in the UK (Newcastle – you are next on my list). Many thanks to Craig McGill and Richard Paterson for getting me a ticket and giving me a reason to get on a train to Glasgow. Also my fellow bloggers Scott and Blair for being lovely. 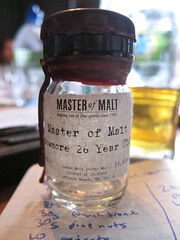 Our coverage from the day, along with a load of other tweets, can be found on the Master Blender blog. There’s also a load more video up on their YouTube channel. I also bumped into Victor Brierley, often referred to as The Bagging Scotland Bloke, who has started doing whisky tours around Glasgow – you should all go. 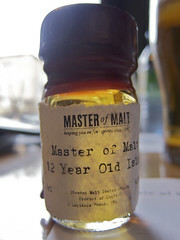 Blended scotch whisky, 46%. ~£28 per bottle. 1 year old spirit drink, american oak aged, 50%. ~£15 for a 200ml bottle. Unaged spirit drink, 50%. ~£15 for a 200ml bottle. 6 month old spirit drink, Californian red wine cask aged, 50%. ~£15 for a 200ml bottle. 5 years old Islay single malt whisky, 59%. Not yet available. 40 year old highland single malt scotch whisky, 40%. £725 per bottle. 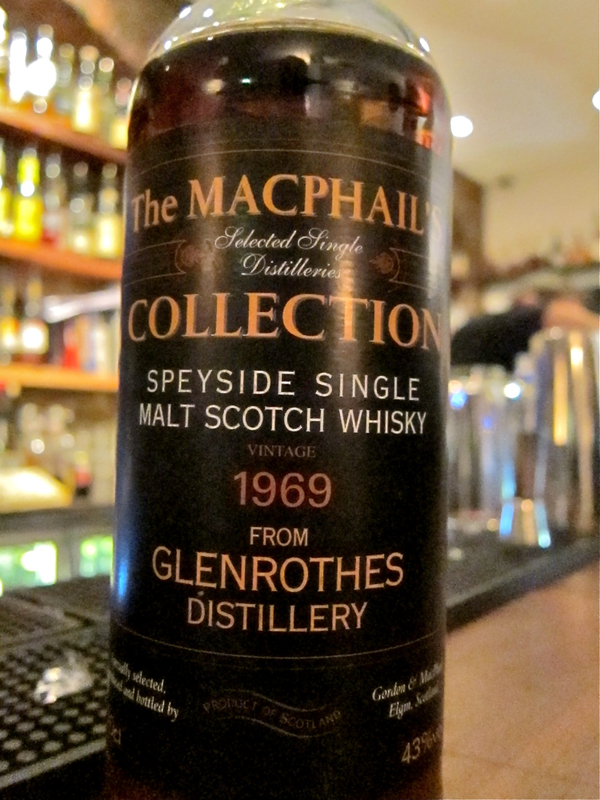 The MacPhail Collection 1969 Glenrothes. 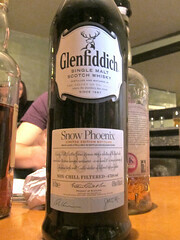 I grabbed a tiny taste of this at Hawksmoor while I was visiting to try out the ice ball machine. 39 years old and a recent acquisition, it’s much loved by the bar staff and they wondered if I’d agree. I did. Vanilla and spicy wood on the nose with struck matches, salty caramel and pepper in the mouth. Water softened the wood into vanilla and brought a background of charcoal. Tasty. Blanton’s Single Barrel – Barrel 153. A 65% cask strength bourbon. I was chatting with the Hawksmoor bar staff about whiskey, having had a shot of George T Stagg (one of my most favourite whiskies, which there will be a post about sometime soon), and they ‘forced’ a taster of this on me. A bourbon that I was not that much of a fan of when I got a bottle for my birthday a few years back, this reminded me of the good elements of that bottle – prickly and perfumed on the nose, it tasted spicy and woody with a weird astringency not unlike PVA glue. A drop of water added a stack of vanilla. A rather complex and interesting whiskey, more savoury than most bourbons I’ve tried. Port Charlotte PC7. 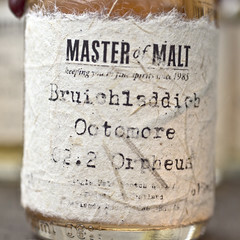 One on the ‘find and try’ list for a while, this is from Bruichladdich‘s ‘other’ distillery. On the nose it was salty with mulching seaweed, which developed in the mouth to a citrusy charcoal burst and a buttery mouth feel. A drop of water piled on more smoke and a strange salty sweatiness. Impressive. Horseradish gin. Not one on the menu on its own, but this is the base for Hawksmoor’s new brunch menu‘s drinky centre piece – a bloody mary. They make theirs (the ‘original’ way) with gin, and infuse a large jar of Beefeater with thumb sized chunks of horseradish to make an interesting starting point for the drink. The horseradish smooths out the bumps in the normally fairly rough Beefeater and adds a beautiful spicy warmth to the flavour. I’m off to buy some bottles, gin and a chunk of horseradish later today so I can make my own – I assume it’ll be great in a bloody mary, but it also tastes nice on its own. 1800 Anejo Tequila. Cactus based booze is definitely on my list this year (especially after speaking to Johan Svensson about agarve tequila recently) and I grabbed a shot of the second cheapest anejo that The Texas Embassy sell while abusing their free chips and salsa policy the other week. It had the classic salt and pepper tequila smell but was a chunk more complex to taste. A woody centre with fruitiness turning bitter on the finish. It burnt on the way down and after it had gone left drying tannins that turned to vanilla. Interesting and a place for me to start from. Marble Chocolate Marble. A present left for me by Alan after my whisky tasting the other week, this is the produce of the Marble Arch brewpub in Manchester. I was meant to be up there this weekend and had already planned a 20 minute dash into the pub to buy some more of their beer, but unfortunately had to cancel my trip. 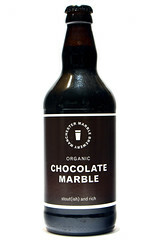 The Chocolate Marble is excellently chocolatey, despite not containing any chocolate as far as I can tell. Stout-ish, as it says on the bottle, bitter-sweet and mouth filling, it may well be my favourite bottled beer I’ve had in a while.